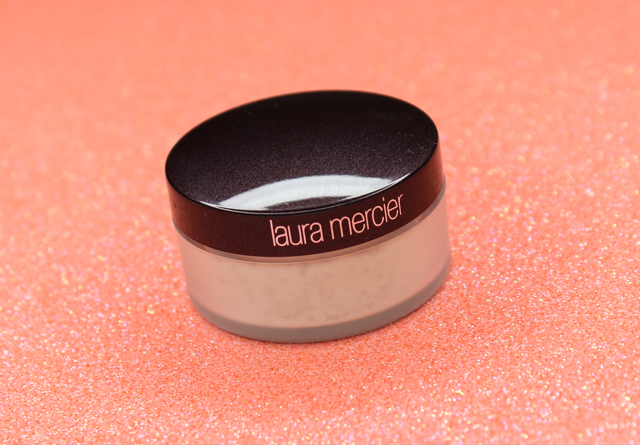 I finally got my hands on the infamous Laura Mercier Translucent Loose Setting Powder. Since it's always so highly raved about, I just had to try it out for myself and see what all the hype is about. This oil free setting powder is toted as sheer, soft, and sets makeup to a flawless finish. It contains a unique light reflecting ingredient that imparts a soft-focus effect, which helps smooth out fine lines and imperfections. The sheer hue is universally flattering, and will compliment all skin tones. The loose setting powder comes housed in a frosted jar which contains a sifter. The sifter is a nice feature, since it helps control how much product is dispersed. But if you need access to larger amounts of powder, the sifter can easily be removed as well. Laura Mercier's Translucent Loose Setting powder is available in two sizes, which is I think is pretty great. I didn't want to commit to the full 1 oz size jar without being sure if I was going to like this powder or not, so opting for the travel-sized 0.33 oz jar seemed like the most logical choice. This powder also came with an applicator puff which feels super soft, is easy to use, and is of good quality. Note: Only the travel-sized jar includes the puff. I mainly use setting powders on my under eye area to lock concealer into place so it won't crease and settle into the fine lines, on my cheeks to soften the appearance of my pores, and on parts of the face where I tend to get oily throughout the day like my forehead and nose. I find that Laura Mercier's Translucent Loose Setting Powder does a good job at taking care of most of my skin concerns. It blurs my pores some, it stops my under eye concealer from creasing, and it gives my complexion a natural looking soft-focus effect that doesn't look overdone. As for the shine control, this setting powder doesn't keep the oil at bay for too long, so a little touch-up is a must after a few hours. A little bit of product goes a long way. I got too overzealous and used way too much powder the first time, which resulted in a cakey result. Not cute. Also, if your skin is on the drier side, make sure to moisturize very well, since this has the tendency to enhance dry areas. When it comes to application, you could use the included puff that comes along with the loose powder, or a sponge like the Beauty Blender (review)-especially if you are going to do the "baking" method, but I prefer using a brush to lightly pack on the powder. My favorite being the Real Techniques Setting Brush (review). I find that with the brush, the finish is much more flawless and smoother looking. I think Laura Mercier's Translucent Loose Setting Powder is pretty good and I do like it. But I am not really sure if I am going to go out and buy the full size of this once I am done using up this smaller jar, since there are still a couple of other loose setting powders that I happen to prefer over this one. I love Ben Nye's Banana Powder (the yellow tint in the powder does a nice job at brightening) and Make Up For Ever's HD Microfinish Powder (It effortlessly fills in pores and softens lines, it controls oil, it's long wearing, and the super fine texture feels so light on the skin). If you are curious about Laura Mercier's Translucent Loose Setting powder, give the smaller travel-sized jar a try first. Who knows? It may just become your HG powder like it is for so many. Which are your favorite setting powders?